Tallahassee, FL - In June 2016, a Buddy Bike was stolen from Florida Disabled Outdoors Association, www.fdoa.org, a non-profit adaptive sports organization in Tallahassee, Florida. The adaptive bicycle was donated to the organization by Buddy Bike, LLC, www.buddybike.com for its use in adaptive sports programs for special needs people. On June 12, 2016, David Jones, President & Founder of Florida Disabled Outdoors Association, returned to Tallahassee from a tradeshow event in Orlando, Florida where they provided adaptive sports activities for special needs families. Jones left his vehicle overnight after returning from the event. During the night, a group of thieves raided the neighborhood and broke into several cars. They stole Jones' truck including the belongings of the non-profit organization. The truck was later found on a dirt road with the supplies and belongings scattered around the area. The Buddy Bike was missing. Jones followed the tracks of the Buddy Bike in the dirt as far as he could but lost the trail at a paved road. Jones said, "It was very sad," and he felt that recovering the Buddy Bike for their program would be hopeless. Jones filed a police report with the Tallahassee Police Department but he did not advise Buddy Bike at the time. Upon learning of the theft, Shelley L. Patterson, Director of Marketing and Business Development said, "This Buddy Bike was not stolen from just one person but from an organization that provides enriching activities to a lot of special needs people." Patterson is hopeful that the Buddy Bike will be recovered based on a previous experience where a Buddy Bike was stolen from a special needs child in San Francisco in 2010 and it was recovered within 7 days of receiving media attention. The Buddy Bike stolen in Tallahassee is an uncommon and eye-catching specialty bicycle and the only model of its kind in that area. Per Patterson, the stolen bike, valued at over $2000, is a Buddy Bike Family 7 speed with bright orange aluminum frame, silver fork, Shimano internal 7 speed hub and fold-out foot pegs. There is one other Buddy Bike in the area but it is a different model with a blue and silver frame. If you have any information regarding this stolen Buddy Bike please contact the Tallahassee Police Department at 850.891.4200. To offer your support to the Florida Disabled Outdoor Association, please contact David Jones at davidjones@fdoa.org or Laurie LoRe-Gussak at lgussak@fdoa.org. The Florida Disabled Outdoors Association is a non-profit 501(c)(3) organization whose mission is to enrich lives through accessible inclusive recreation for all. FDOA is a chapter of Disabled Sports USA. To learn more visit www.fdoa.org. 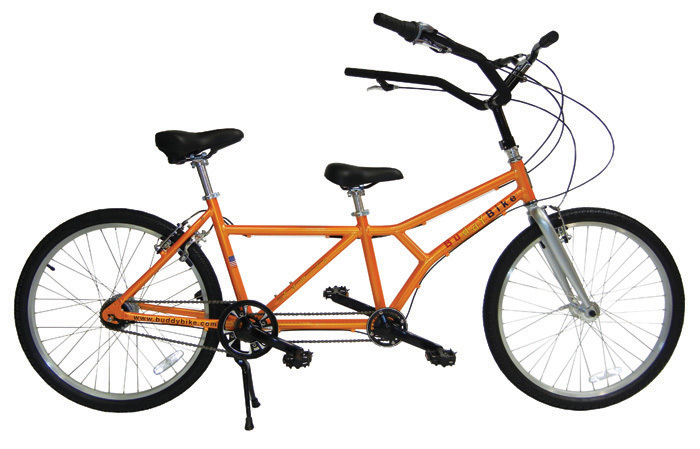 Buddy Bike, LLC is the manufacturer of an alternative inline tandem bicycle that places the stoker in the front seat while the rear rider controls the steering. The features of the Buddy Bike offer adaptive outdoor recreation and therapeutic activity to riders with cognitive or physical disabilities who may not be able to ride a bicycle safely on their own or who do not have the strength to pedal a bike alone. They strive to provide courteous and timely service to their customers while providing a quality product that will encourage more families to bicycle, especially families with special needs children who might otherwise never enjoy the thrill of riding a bicycle. For more information visit www.buddybike.com or call 786.489.BIKE (2453).